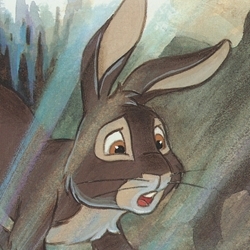 For the time being anyway, as long as I use the picture, you get to caption my current avatar of one very angry bunny! Hawkbit: Bigwig always assign me to some night duty, but that's alright. Who needs to sleep anyway? Don't tell me....the scrapes aren't big enough so I got to sleep outside....again. That's the last time I play bob-stones with Fiver. It is always me who has to clean up after Kehaar when he visits!